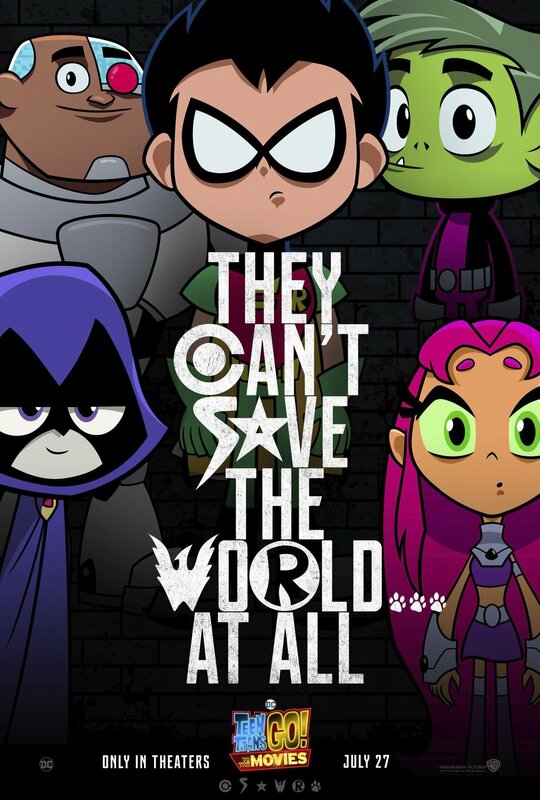 A new poster has been released for DC Entertainment's upcoming animated film Teen Titans GO! to the Movies. As you can see, it's the same style as the poster for Justice League. The characters include Robin, Cyborg, Raven, Beast Boy, and Starfire. The tagline on the poster isn't as encouraging, though. "They can't save the world...at all"
A lot of fans of the series are excited about this movie. If you haven't watched the trailer for it yet, you can watch that here. It looks like it could be a fun and silly movie to enjoy with the kids. It seems to the Teens that all the major superheroes out there are starring in their own movies-everyone but the Teen Titans, that is. But de facto leader Robin is determined to remedy the situation and be seen as a star instead of a sidekick. If only they could get the hottest Hollywood film director to notice them. With a few madcap ideas and a song in their heart, the Teen Titans head to Tinsel Town, certain to pull off their dream. But when the group is radically misdirected by a seriously super villain and his maniacal plan to take over the Earth, things really go awry. The team finds their friendship and their fighting spirit failing, putting the very fate of the Teen Titans themselves on the line. The animated film will feature the voice cast of the series, including Greg Cipes as Beast Boy, Scott Menville as Robin, Khary Payton as Cyborg, Tara Strong as Raven, and Hynden Walch as Starfire. Will Arnett (The LEGO Batman Movie) and Kristen Bell (Frozen) have also joined the voice cast. The movie was directed by Aaron Horvath and Peter Rida Michail, from a script written by Michael Jelenic and Horvath. Teen Titans GO! to the Movies is set to hit theaters on July 27th.